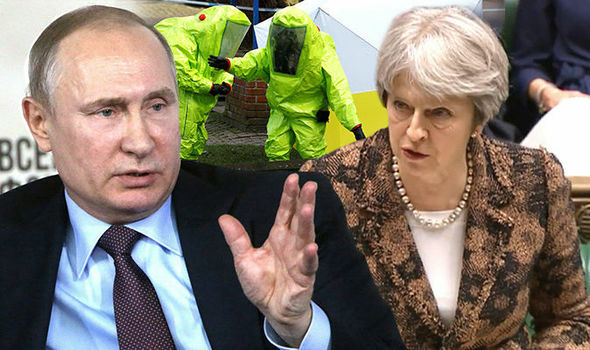 In a series of tweets the Russian embassy in the UK said: “Moscow will not respond to London’s ultimatum until it receives samples of the chemical substance to which the UK investigators are referring. Russian Foreign Ministry spokeswoman Maria Zakharova said: “Who does Britain think it is, issuing ultimatums to a nuclear power?. The news comes as Nikolai Glushkov, a Russian businessman and close associate of late Putin critic Boris Berezovsky, has been found dead in the UK, according to reports. Mr Glushkov, a former deputy director of Aeroflot, died at the age of 68 at his London home in New Malden, according to Russia’s business FM radio station. The 68-year-old’s body, which had ‘strangulation’ marks on his neck, was discovered by his daughter, according to Russian newspaper Kommersant. Mr Glushkov was twice charged with fraud in Russia and was a close ally of Mr Berezovsky, who was once one of the most powerful businessmen in Russia and played a pivotal role in Vladimir Putin’s rise to power during the late 1990s. This entry was posted in Axis Powers, Espionage, Europe, Great Britain, National Security & Terrorism, Nuclear Weapons & Proliferation, Politics, Soviet Union and tagged 'Don't threaten a NUCLEAR power': Putin REJECTS British ultimatum on Russian spy attack, Aeroflot, Boris Berezovsky, British ultimatum, Chemical Weapons Convention, Espionage, europe, Great Britain, kommersant, Kremlin, London, Maria Zakharova, Moscow, National Security & Terrorism, New Malden, Nikolai Glushkov, nuclear power, Nuclear Weapons & Proliferation, russia, Sergei Skripal, Theresa May, Vladimir Putin, Whitehall, Yulia Skripal. Bookmark the permalink.